Honeymoons in the Riviera Maya are unforgettable! Your getting married and the most exciting event other than the ceremony is your vacation to follow. You want the perfect vacation right? Whether your only spending a few days or several weeks, you don't want to be disappointed, but be able to enjoy the most beautiful place with your sweetheart! There are some top notch hotels and resorts in the Mexican Riviera that offer unforgettable experiences for your honeymoon. 1) Do I choose a resort that is adult only or has kids? 2) Do I want to spend most of my time at the resort therefore choosing an all inclusive hotel, or will I spend more time away from the resort and eat meals outside the resort. 3) How much am I wanting to spend & how many days do I want to stay? If you can answer these questions then you will find the process of selecting a honeymoon very easy! It's easy to spend hours and hours researching different hotels, resorts, boutiques, locations and feel overwhelmed. I've done all the research for you! So just sit back and grab your cup of coffee as you plan a stress free vacation with your sweetheart! As you know I only recommend the best of the best out there.. so here you go! El Dorado Royale is a 5 star hotel with top notch gourmet food, beautiful white sand beaches and service that matches the quality! Excellence Riviera Cancun is part of the Excellence chain and you won't be disappointed. Iberosar Grand Hotel Paraiso is on the purest of white sand beaches and is next door to 2 sister hotels that you get to use for free! Aventura Spa Palace is a large resort with over 700 rooms and exchange priveleges with 8 other resorts. Valentin Imperial Maya is only a few years old and has an Italian feel to it with large murals, fountains and columns throughout the resort. El Dorado Seaside Suites has hammocks on every balcony and is a intimate, quaint resort. El Dorado Maroma has amazing service and gourmet food, not to mention lots of private beach. If you want your own private plunge pool and don't mind spending the extra cash, try Rosewood Mayakoba or Zoetry La Bonita. El Dorado Maroma is a small, intimate boutique hotel located on one of the top 10 beaches in the World! Small hotel, but big service! It's pricier, but definitly worth it! 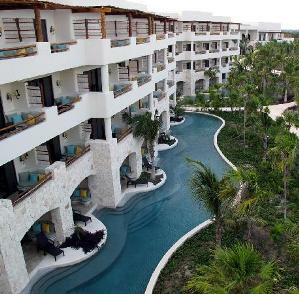 Secrets Maroma is a 1 year old large resort! You will have plenty to do at this all inclusive! My top two choices for this category is Dreams Tulum, which puts you in a great area to visit tons of cenotes and other activities. Dreams Puerto Aventuras will also not disappoint with it's beautiful property and romantic pools. Well, those are my top Honeymoon resorts! Choose any of these and you will not be disappointed. They all have lots of experience with couples and they love to cater to you! You will be blown away with all the amenities these resorts have! If your interested in another beautiful location, check out Barbados - information on some of the best beaches.